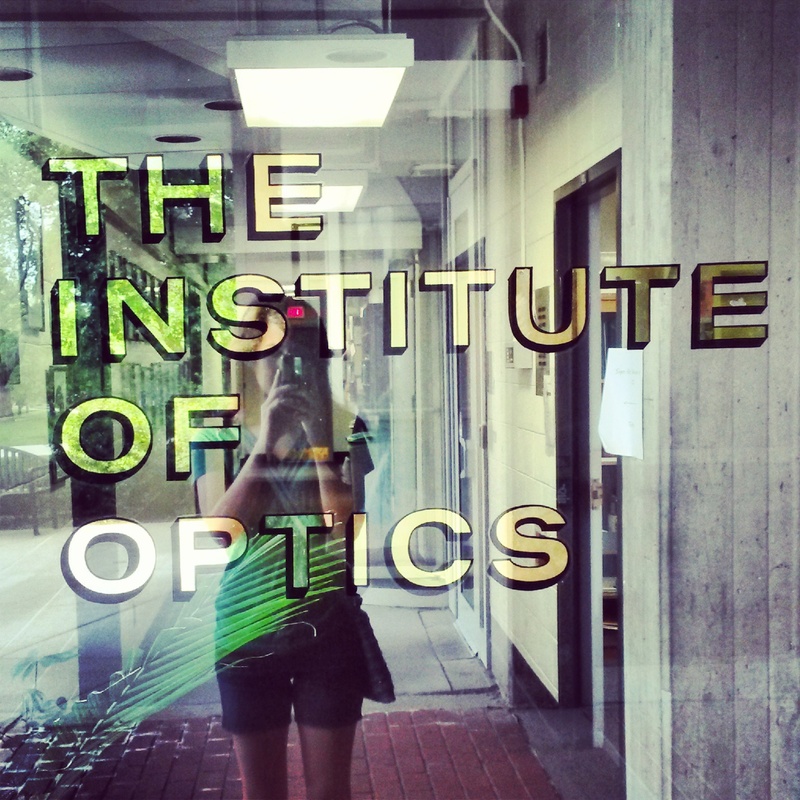 The Institute of Optics is located at the University of Rochester. Back at the University of Arizona I have taken several classes involving labs from physics to chemistry to material science and, of course, optics. The optics labs above the others engendered a unique spark of excitement within me. I mean when else do you get to spend a few hours sitting in the dark with five of your friends shooting lasers at things? My enthusiasm may also have its roots in the fact that optical engineering is my major. So I maintain a healthy bit of pride surrounding all things optics. Working in the optics lab here at the University of Rochester is both similar and dissimilar to the labs accompanying my educational courses. When a lab is part of a class it means that someone has thought through every detail and even typed up a manual describing the theory and procedure in detail. Certain goals are outlined and certain results are expected. In actual research, however, the parameters and expectations are much more free. The set ups are to be refined and the results are to be determined. When I arrived at U of R the five projects I could choose from had already been started. This meant that I did not have to design any experiments from scratch. It also meant that the theory had been considered and results had been predicted. My job was to fix the problems with the guidance of the grad students, take measurements, and analyze the data. Here are some of Dr. Boyd’s publications that I read regarding his research. Something I did not realize until I arrived was that the first couple days of the program would involve primarily reading. On the first day Rachel (my fellow REU student) and I went to Dr. Boyd’s lab, Joe (a post doc in the lab) and Mohammad (a PhD student) explained the five projects for us. 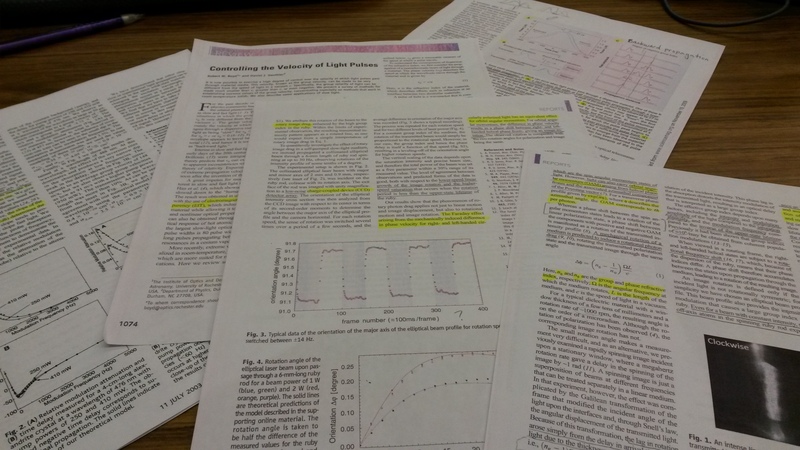 They also printed out publications regarding the work that had already been done on these experiments. Rachel and I spent that day and the next reading through documents deciding what we wanted to work on. I spoke with other students in the REU program and they were having similar experiences. I ended up choosing to study the behavior of a fast light material called alexandrite, which I will discuss in a later post. It is definitely a fun and interesting subject. At any rate, I have enjoyed wading into the waters of higher-level thinking and science. Sounds awesome! Can’t wait to hear more about alexandrite! Thank you! I will be posting more about the lab work next week. 🙂 I love you, Mom.